Continuing East on the York Haven line from Shocks Mill Bridge, we encounter more history on the fabled low-grade project of Alexander Cassatt. The east bank of the Susquehanna River was host to two major modes of transportation by the mid 1800’s, the Public Works Canal and the Columbia Branch of the Harrisburg, Portsmouth, Mount Joy and Lancaster Railroad. By the time plans came for the new low-grade the canals had been largely abandoned for some time, however the Columbia Branch became a vital link to the original Philadelphia and Columbia as well as the Columbia & Port Deposit Railroad providing connections to the mainline via Royalton. While designing the new low-grade the Columbia branch was the choice line to connect the Northern Central via the new Shocks Mills bridge, the old alignment would require revisions to fit the requirements of the new line. By the turn of the century Cassatt’s low-grade project would bring big changes to the local railroad scene. With the consolidation and construction of the new freight network many of the older track alignments were abandoned in favor of a separate right of way to avoid pedestrian and street traffic. 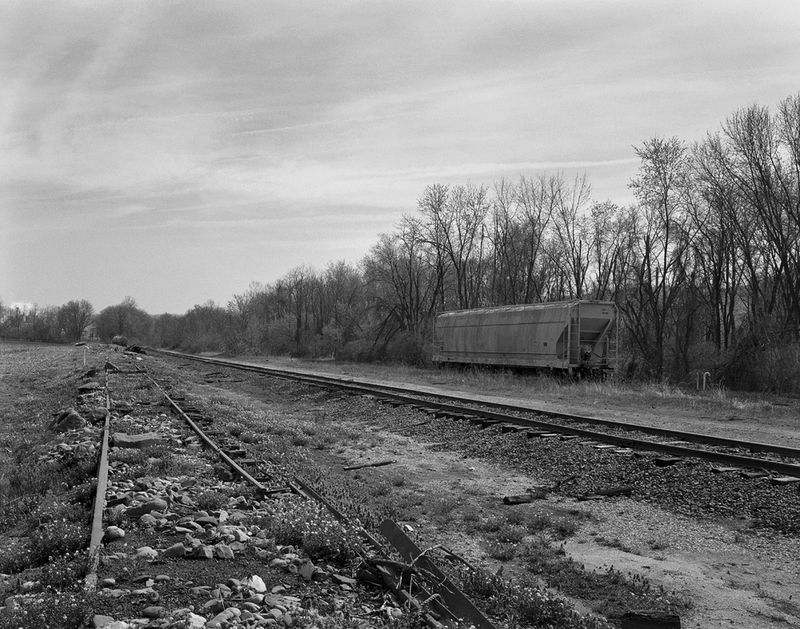 Common to many locations on the PRR, these abandoned segments were either sold off or utilized as stub end tracks to serve industries still active near the town centers. Interlocking plate of "Shocks" location of the junction of the former Harrisburg and Lancaster branch between Royalton and Columbia and the low-grade York Haven Line. Note the track diverting to the right of the interlocking point titled "to yard", this is the original alignment of the H&L Columbia Branch retained to serve several freight customers. Plate collection of The Broad Way. In the village of Rowenna, just east of the Shocks Mill Bridge, a segment of the old Harrisburg and Lancaster drops off the embankment where the Royalton - Columbia branch and the York Haven line meet at an interlocking simply known as Shocks. This spur continued parallel to the mainline for several miles accessing agricultural industries and a military transfer depot constructed during World War II. Sill in service today, this branch serves the former Military installation, now an industrial park as well as a feed trans-load facility off Vinegar Ferry Road. Remaining trackage from the old Harrisburg, Portsmouth, Mount Joy and Lancaster Railroad's Royalton - Columbia Branch, now an industrial track retained to serve a few local customers. The active 1902 York Haven line alignment is out of view to the to right on an elevated fill to accommodate trains off the Shocks Mill Bridge. Just a few miles further east we enter the Borough of Marietta. Established in 1812, Marietta once boasted many river, rail and canal dependent industries. On the south end of town remnants of the old Columbia Branch surface in an isolated area bound by Chiques Creek and Furnace Road. This area, which the creek and a local iron furnace are named after (albeit different spellings) derives from the Native American word Chiquesalunga, or crayfish. In different eras it has been spelled Chickies, Chikis and Chiques but all refer to this common meaning. The Chickies Furnace #1 opened in 1845 with production thriving until the late 1890’s closing due to better, more efficient facilities, most likely in nearby Steelton. Remaining bridge piers of the former Columbia branch stand up-stream in Chiques Creek. In view is one of William H. Brown's typical stone arch bridges on the active York Have line. This area is located at the former site of the Chickies Furnace, an early site of iron production in the 1800's. Among the foundations and rubble that remains of the former Chickies Furnace #1, the Columbia branch can be found along the old canal bed. You can spot telltale signs of PRR construction methods, the most immediate is the use of the ubiquitous 3 pipe railings on a bridge over a sluice between the canal and creek. Piers also remain from a deck bridge that carried the branch over the creek prior to the 1936 flood while the former roadbed of cinder ballast provides reference of where the line entered the area from the west. Just down stream on Chiques Creek, the York Haven line crosses the outlet to the Susquehanna on a W. H. Brown trademark 3 arch stone bridge well above high water. The history of when the Columbia branch was abandoned ties into not only the construction of the low-grade but also the great flood of 1936, subject of next week’s post! Alternate view looking upstream at Chickies Furnace reveals the dam that fed a channel for the old iron works as well as the various walls that date back to the original 1846 furnace site. Note the piers from the former Harrisburg, Portsmouth, Mount Joy and Lancaster Railroad Columbia branch. The piers were most likely upgraded around the same time the low-grade was built judging by the similarities in the stone when compared to the newer arch bridge down stream.